Without a doubt technology has changed tremendously over the years, and as a consequence, customer requirements have become more and more demanding. In addition, competitors entered the market with new radar concepts with the main purpose of fulfilling the needs of the users. As near-miss incidents frequently occur in today's busy aerospace, state-of-the-art Air Traffic Control Radars have to deliver an outstanding exposure and protection from potential threats to the smallest aircraft such as ultra light gliders as well as the largest passenger aircraft. Nowadays the airspace is divided between civil and military users, general aviation traffic as well as leisure time flights. In the challenge to meet all detection performance and safety requirements, one needs to provide more powerful surveillance sensor solutions. Having the ASR-S (Airport Surveillance Radar) as its predecessor, the ASR-NG® takes a step further in terms of technological advances and extreme sensitivity capabilities, thus making an important contribution to the efficient use of airspace. With the aim of fulfilling both civil and military needs, Cassidian's product philosophy is targeted towards cost effectiveness, reliability and last but not least, user satisfaction for airspace safety. Our goal is to connect and build strong relationships with our customers by offering them excellent services and successful execution of projects. Above it all, the ASR-NG® system offered by Cassidian is one of a kind , reliable, affordable and least but not least high performance ATC radar. In addition to incorporating one of the only AIMS 03-1000A certified secondary surveillance radars available, its algorithms, methods of signal processing and subclutter visibility result in extremely reliable detection and tracking performance under the most challenging weather conditions, over heavy clutter including wind farms, and against the smallest targets including UAVs, gliders, and ultra light planes. Our product has been specified, designed and developed in order to meet the highest international safety standards and requirements. The system is certified by the German authorities to be compliant with RTCA DO-278, ED 109 AL4, EATMP SWAL3, IEC 61508 SIL2 and hence guarantees inherent functional safety. •the ability to recognize the smallest objects as well as the biggest ones with full detection performance (15rpm, RCS 1m², 90% Pd, 80NM). 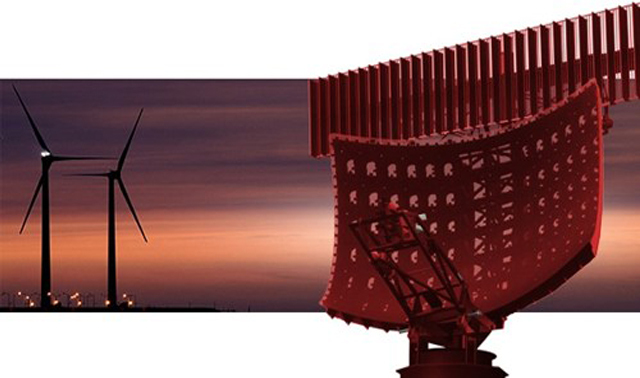 •Cassidian has been the centre of excellence for radar technology within Germany for more than 50 years. •Cassidian along with its heritage companies Telefunken and Siemens Defence have installed troughout time several hundred military X, C, S and L Band radars as well as ATC radars at installations around the world. •The ASR Tracker performance is considered, from the German customer's perspective, as " best of the world"